In Single Selection mode, click on any item, to see just that item, or click (All), to see all the items. You can hide pivot items, but at least one pivot item must remain visible. You can't do a "Hide All", either manually, or with a macro. 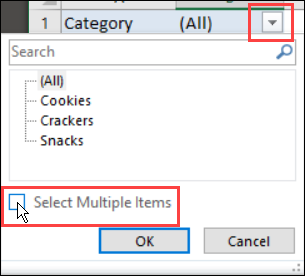 In Multiple Selection mode, click on any check mark, to clear a check box, and hide that item. Instead of selecting pivot items manually, you can use a macro to show or hide multiple fields. The following code will show all items in all row fields, in ALL pivot tables on the active sheet. To show column fields, change pt.RowFields to pt.ColumnFields. To show all fields, change pt.RowFields to pt.VisibleFields. 'sort is set to Manual to prevent errors, e.g. Instead of hiding pivot items manually, you can use a macro to show or hide multiple items. 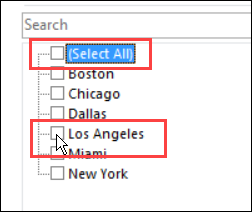 Excel will not allow you to hide all the items though -- at least one pivot item must be visible. 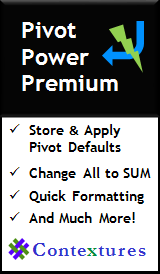 The following code hides all items, except the last item, in all row fields, in ALL pivot tables on the active sheet. To hide column fields, change pt.RowFields to pt.ColumnFields. The following code will prompt you for a pivot field name, and will show all items in the specified pivot field. It affects the first pivot table on the active sheet. The following code will prompt you for a field name, and will hide all items (except the last one) in the specified field. It affects the first pivot table on the active sheet. Thanks to Jeff Bloomer, who contributed this code. The following code will prompt you for a field name and item name, and will hide all other items in the field. It affects the first pivot table on the active sheet. strPromptPF = "Please enter the name of the field you wish to filter." strPromptPI = "Please enter the item you wish to filter for." The following code will prompt you for a field name, and will show all items in the specified field, in the active pivot chart. The following code will prompt you for a field name, and will hide all items (except the last one) in the specified field. Right-click on in item in that pivot field. 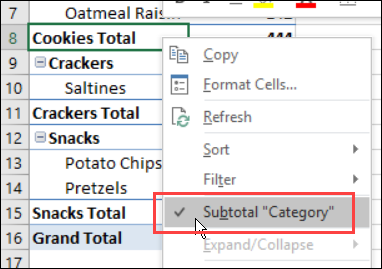 The following code removes ALL subtotals from ALL pivot tables on the active sheet. 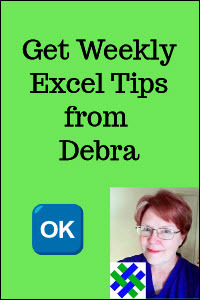 Download the zipped sample file for this Excel pivot table tutorial. The file is in xlsm format and contains the macros from this page. Remember to enable macros when you open the file, if you want to test the macros.